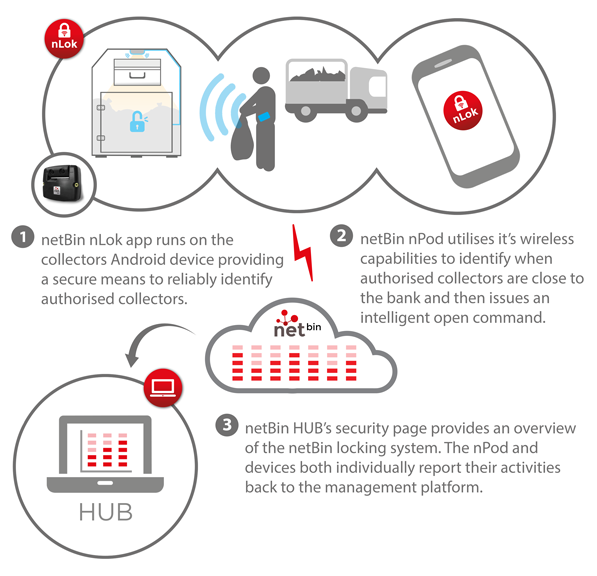 Combat theft of textiles with the secure netBin nLok system which identifies and autonomously grants access to authorised collectors only. Our unique solution confronts a worldwide issue of repeatable theft from textiles banks. nLok allows you to control and manage 1000s of electronically secured textile banks from one central management platform with ease and professionalism. Combined with our industry leading textile fill level monitoring sensor you will have the ultimate gateway to efficiency, cost savings and security. Thousands of textile banks now operate using our systems, get in touch to find out how we can save you money and win you more contracts. The inner workings of nLok are of course confidential but see below for short summary of nLok’s operating principle. Please get in touch with our very experienced and friendly staff for the whole story, they will check that nLok is a suitable solution for you and answer any questions you may have regarding the installation, operation and cost. After establishing outlines of the project we can arrange a live demo to illustrate some of netBin’s best features currently in use in the field. LTE Cat M1 bins sensors here soon!